Одна из Многих | One of Many (USSR 1927) | Silents, Please! 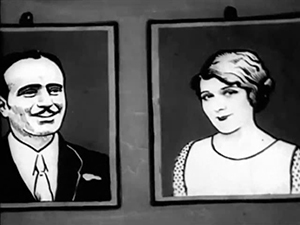 A Soviet girl dreams of Hollywood in the charming short combined live action/animated film Одна из Многих | One of Many (USSR 1927). 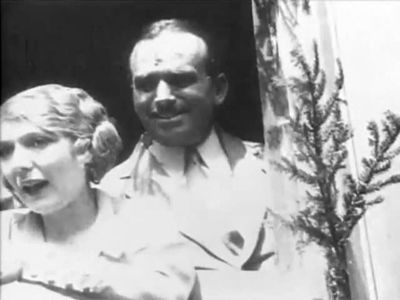 Like Потцелй Мери Пикфорд | A Kiss for Mary Pickford, also 1927, One of Many takes its cue from Mary Pickford and Douglas Fairbanks’ visit to Russia in 1926. The story follows a film-obsessed young girl (played by Aleksandra Kudriavtseva) who arrives home, still dizzy with excitement. Because today was the day that she saw … Mary and Doug! And not only that, but: “Mary SAW ME!” The inserted newsreel footage is cut so as to give the illusion of a special moment of eye contact between her and Mary & Doug. Her joy is palpable. 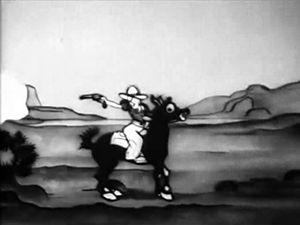 “She’ll take me to – AMERICA!” And when the girl lies down to take a rest, she is transformed into a cartoon character – and the film enters an animated Hollywood dreamland. 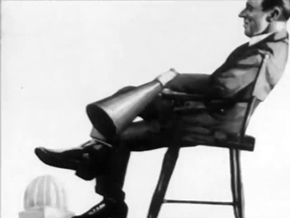 D. W. Griffith! 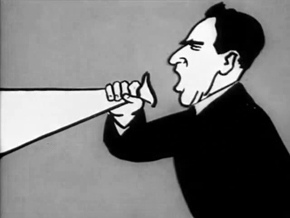 Here described in an intertitle as the “Hollywood Bolshevik” … well, that’s one way of looking at him, I guess. From there, she meets Chaplin on the street – he’s mean to her and so she gets upset, but luckily Pat & Patachon (Karl Schenstrøm & Harald Madsen) are there to help her out. The grimace of Chaplin; Pat und Patachon. Pat und Patachon (originally Fy og Bi in their native Danish) are forerunners of Laurel and Hardy, in that they’re a screen comic duo made up of one tall skinny man and one short fat man. I’ve not been highly enthused about what I’ve seen of them, but they were very popular in Europe in their time. Really, their inclusion in this film is a bit surprising, as they never worked in Hollywood – but let’s not quibble. Pat and Patachon form a human horse to transport our heroine – all the better from which to spy Harold Lloyd’s motoring mishaps! Skyscraper hi-jinks ensue before the girl is plucked from the sky by a dinosaur and completes the holy trinity of silent comedians by meeting the dino’s master: Buster Keaton, clothed in his caveman outfit from The Three Ages (1923). One of Many was made at the famous Mezhrabpom-Rus studio in Moscow, directed by Nikolai Khodatayev, working with a mostly female team. I find the animation style very appealing – not polished, sure, but that adds to the charm. And as a device for looking at the difference between dreams, reality, and the movie screen, the combination of live action and animation is very successful. I first saw this film when it screened at the 2013 Giornate del Cinema Muto in Pordenone; I immediately thought of Sherlock, Jr. (1924; one of my all-time favourites), and indeed in the catalogue notes Sergei Kaptarev cites Keaton’s film, released in Russia as Одержимый | The Obsessed, as a possible reference. 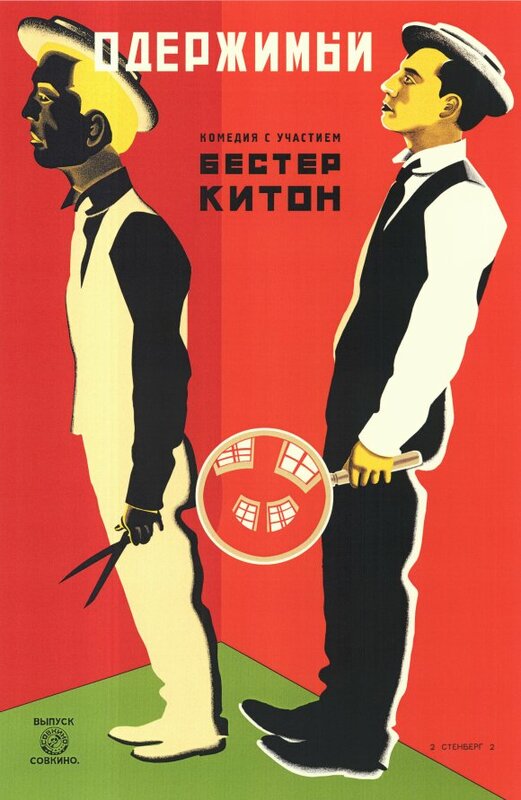 The film needs to be seen in the context of the Soviet Union’s New Economic Policy (NEP; 1921-28). Relative to the first years of the USSR (and of course, the Stalin era following it), the NEP was a period of greater economic and cultural freedom. That is not to say that it paralleled Western culture; in her article The Dance Class or the Working Class: The Soviet Modern Girl, Anne E. Gorsuch notes that the main sources of cultural transmission in the USSR differed from those in capitalist countries, with advertising, commerce, and the mass media functioning differently therein compared to in many other locales. 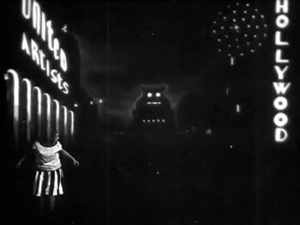 Movies were a key source of international cultural information; between 1921 and 1931, the Soviet Union imported about 1700 American, German, and French films. Not surprisingly given the content of One of Many, Gorsuch cites Pickford, Fairbanks, Lloyd and Chaplin as the audience favourites. Одна из Многих [Odna iz Mnogikh]. Dir. Nikolai Khodatayev. Moscow: Mezhrabpom-Rus, 1927. 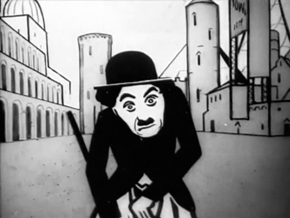 This entry was posted in Film and tagged animation, Buster Keaton, Charlie Chaplin, cinema of 1927, D. W. Griffith, Douglas Fairbanks, film about film, Harold Lloyd, Hollywood, Le Giornate del Cinema Muto, Mary Pickford, Nikolai Khodatayev, Pat und Patachon, Soviet cinema, Tom Mix. Bookmark the permalink. I really enjoyed this writeup! I take great pleasure in the fact that the Soviets (Kuleshov and Eisenstein among many) were obsessed with Hollywood. Thanks for the comment! :) Yes, it’s a neat film. I love this kind of meta-commentary and it’s done in such a charming way. You have a wonderful blog. But not so many Soviet movies are reviewed (Protazanov, Vertov, Eisenstein, Dovzhenko etc.) Is this epoch not interestng for you or they are still ahead? That would be nice to read something about “The Lady and the Hooligan”, “Aelita”, “41st”, “Defence of Sevastopol” – some remarkable movies, that are not so famous. Hallo Anton and thank you for your comment! You’re right, that is surely Gertie! And I see your point on Pat and Patachon, they were huge in Europe for sure. P.S. Let me know if you’ll need help with translation of intertitles from Russian to English. I’ll be glad to be of service to you. The 41st does look good, and I quite like Ivan Koval-Samborsky. And with “Hooligan”, the Mayakovsky connection is certainly a drawcard. Anna Sten’s films were another one I was going to mention – love her! Thanks for the offer! I may take you up on it. I can read Cyrillic script and know a few words of Russian, but anything extensive is a bit beyond me. what really saddens me is that fy og bi never got a danish dvd released but germany did! ?, i really love these two like i got other big loves for retro comedy duos such as laurel and hardy. the 1920s and 1930s have always been my favorite decades of comedies that hold a special place in my heart. Huh, a shame indeed that a Danish DVD was not released! Maybe in future one will appear? i also kinda have a major crush on carl schenstrøm (who is pat, the tall guy). im i the only one who thinks hes hot and cute?